Five Fingers Has The Hand (5 Finger Hat Die Hand). A Simple Photo. A Powerful Political Symbol. LEARN MORE about this piece, including a curator’s personal recollection. Adolf Hitler did not march into Berlin in 1933 on the shoulders of an army of Nazis. Hinderburg offered Hitler the chancellorship of Germany in a disintegrating political climate. The Nazi Party held only 46 percent of the Reichstag. Chancellor Hitler immediately outlawed everything and everyone that was not aligned with Nazi philosophy. The text on the poster translates to: “5 fingers has the hand! With these 5 grab the enemy!“ The “enemy” was the Nazi Party. The KPD had a good chance to politically defeat Hitler. However, Nazi propaganda was strong. It relied on German nationalism and economic hardship. John Heartfield was perhaps the greatest threat to Nazi propaganda. Many of Berlin’s most creative and talented artists also joined the KPD. The same was true in the United States at that time. Later, those American artists would suffer because of the shameful Joe McCarthy hearings. John Heartfield also suffered when he was forced to return to the repressive communist government of East Germany (GDR). However, in 1928 Germany, there was no doubt that between the KPD and The Nazis, the communists were surely the lesser of two evils. An election that would determine the course of German history was approaching. The KPD was in desperate need of a symbol to inspire Germans to vote for the five KPD candidates. 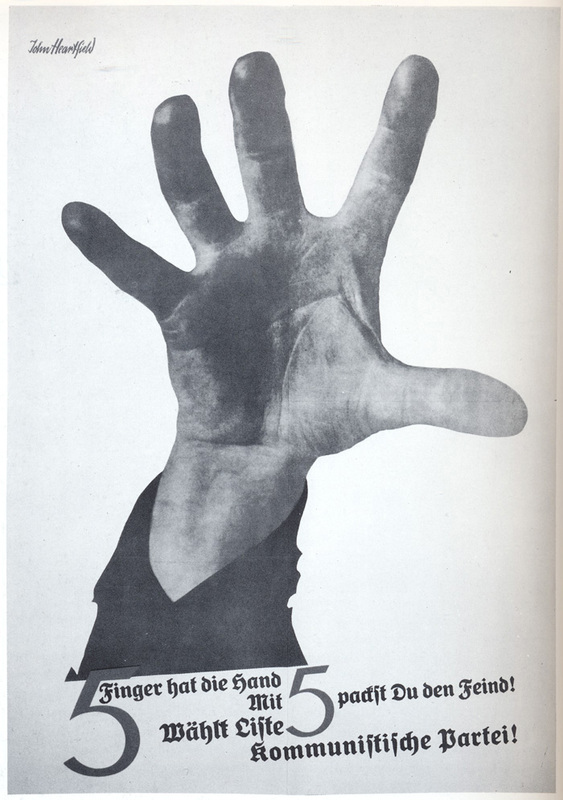 Heartfield stood up in a meeting to declare there was nothing more powerful than the human hand when the five fingers work together. The hand was a perfect symbol to oppose Hitler (or any dictator). John Heartfield waited outside a factory. He had his photographer take photo after photo of worker’s hands until the exact image that was needed was captured.